Accordion-style doors lead from the living area to outdoor living in this move-in-ready home from Coast to Coast at 3012 Palo Parkway. High-end homes on just thirty-eight lots in a prime location has been a winning formula for Kalmia38, the peaceful north Boulder enclave east of Sale Lake between Kalmia Avenue and Palo Parkway. 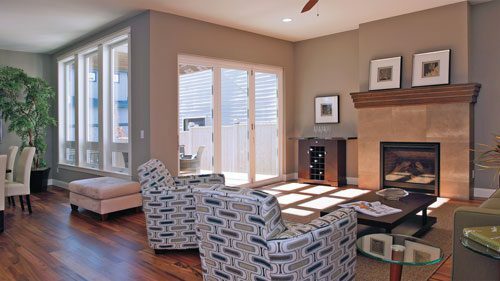 Tucked among established neighborhoods and mature trees, the community features a variety of architectural styles in single-family homes from the four local builders who created Northfield Commons and Northfield Village, also in Boulder. Home buyers looking for new construction are drawn to Kalmia38 and its amenities, including trail access, a beautiful streetscape and nearby coffee shops, restaurants and services. The community offers that rare combination of a serene and relaxing vibe within close proximity to the conveniences of an in-city location. Not to be overlooked, Kalmia38 also provides never-lived-in homes for buyers intent on fresh styling and modern finishes. Everything’s new, from the furnace to the woodwork, ready for a buyer to turn a house into their home. The final two homes that Boulder-based Markel Homes will build at Kalmia38 are nearly finished. The homes feature an open floor plan, impeccable styling and high-end finishes. One property is designed for the buyer who prefers sleek contemporary lines, prominent glass and the distinctive butterfly roof. The second showcases the Craftsman style of architecture, with a sophisticated mix of great-looking exterior materials and stunning, bold accents. Quality green construction, fine craftsmanship and Energy Star® efficiencies are hallmarks of the Coast to Coast brand of home building. Two homes are currently available from Coast to Coast at Kalmia38, including a move-in-ready property and another on-track for a July completion. With banks of distinctive windows and strong architectural lines, both homes offer open plans and features designed to please today’s high-end home buyers. Located at 3092 Big Horn St., the Kalmia38 sales office is open daily from 11 to 5 p.m. For more information about the community, the builders and the properties currently for sale, contact Sales Manager Roz Giannasi Pinon by phone (303.442.0309) or e-mail (roz@kalmia38.com). For more information, visit Kalmia38.com. The Markel Homes’ properties are also featured on the company’s website at MarkelHomes.com. By Rebecca Lee, At Home. Photography by Markel Homes. features a butterfly roof, prominent glass and sleek contemporary styling. Right: Craftsman architecture from Markel Homes offers a sophisticated mix of great-looking exterior materials and stunning, bold accents. Left: Enjoy panoramic views from the rooftop deck on the move-in-ready home from Coast to Coast at 3012 Palo Parkway. Right: On track for a July completion, this two-story Craftsman from Coast to Coast occupies one of the larger lots in Kalmia38.